Before I get to discussing the final season of Voltron and why it made me happy, I think it’s worth addressing that I don’t think this series is perfect. No series is perfect. In this specific case, there’s a bunch of stuff that annoys me, or things I’d rather they have done differently, moments where in this thirty hour long story, I would rather they have not. These are disagreements, they’re irritations – not quite at the level of a pet peeve, but bigger, and more specific, like a beef. I have beeves. I try to make sure that my complaints about a series aren’t about what a series isn’t. I’ve talked about extrinsic vs intrinsic factors in television before. An extrinsic factor is things like ‘the budget was changed,’ or ‘this actor had to leave.’ An intrinsic factor is something like ‘this show chooses to be about men’s pain over women’s,’ (for example). And things like ‘this series wasn’t about the things I wanted it to be about’ are pretty extrinsic to me. We’re going to talk spoilers, after the fold. I’m not a fan of psychic battles. Psychic battles may sound interesting to you if you’re just approaching the idea, but they’re often kinda this way of in-universe showing off your story points as metaphors. The storyteller can already put things in universe as metaphors for greater points the characters deal with, and I mean, that’s almost kind of fundamentally what storytelling is about, so adding an extra layer to it is really boring to me. It’s like a facsimile of something important. Another thing I hate about psychic battles is that they’re so often not about the people going into it. When you’re talking about the mind, you’re often getting a chance to show or express something about the character, and they never spend that opportunity. Imagine if in a psychic landscape, Lance had had looked more like his self image, or Keith had looked smaller or younger, or Pidge taller, or just anything to represent that the characters’ mental state is not completely, 100% compliant with their physicalities. In Knights of Light 1-2, the Paladins journey into Honerva’s mind, and there, the thing that lets them both escape and learn about their next step is already there. This bothers me a lot, in a sort of point-and-click puzzle way. I mean, you have these five characters, with their own complex mental states, but mostly, nothing of them gets shown in this episode. A good storytelling scene can show you two things at once, but the whole arc here is made up of scenes that show us one thing. Giving us a two part episode, right towards the end of the series, as a way to explicate Honerva’s plan, was both slow, and kinda tedious. It also seems to have been a place to save some money; you get full, long slow stock animations, long sequences of objects moving slowly across a star scape, the Paladins as static shapes moving down onto a field. I get that you have to save money, I really do, but because it spent that money doing something I already didn’t like, I think it stood out to me more. It’s like when you’re watching Utena, you kind of just want to know how the duel goes, not how she gets there. Multiple people warned Allura about whether or not she could handle the Dark Entity. She could. She did. She was right, they were wrong. No need to get fancy about it. The story didn’t need to spend scenes explaining it because there was nothing to explain. Zarkon could have been forgiven for what he did, and he absolutely was not. Keith: What do we do? Zarkon: Oh hey, you don’t give up, you’re like me. I’m trying to keep shipping opinions out of the way, because the community and its relationship to ships is kind of toxic, and it’s the definition of something extrinsic. 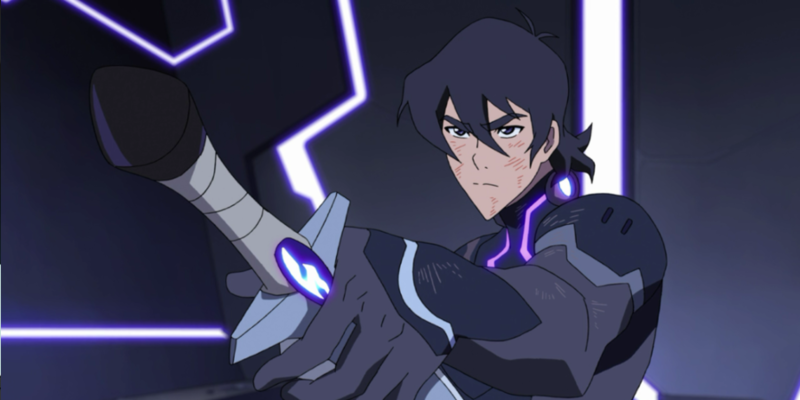 Nonetheless, there is, in the series, a pair of demonstrated relationships that make it to the end of the series and one prospective one that tries to happen earlier, and while they are both kept at arm’s length through the vast majority of the series, I gotta say I really didn’t like Allura/Lance, or Allura/Lotor. It’s not that I don’t think Allura should have a romantic drive or that Lance isn’t good enough for Allura (though he absolutely is not). I guess the thing is, it’s that I just don’t care. I feel like the few showings we get for Allura/Lance were mostly to show us that it was happening as a background element – the series even avoids showing us the character kissing, so I suppose they agree with me there. This series is so light on romance, and that lets the story focus on these friendships. It’s a space where people can have intimate, responsive, caring friendships, and Confirming A Ship feels like it’s doing something that’s both unnecessary and will annoy a lot of people. I’d have rather they leave all the possible relationship space unanswered, and then just close out the series with the understanding that Whatever Shipping You Wanted Still Has Room To Happen, Okay? 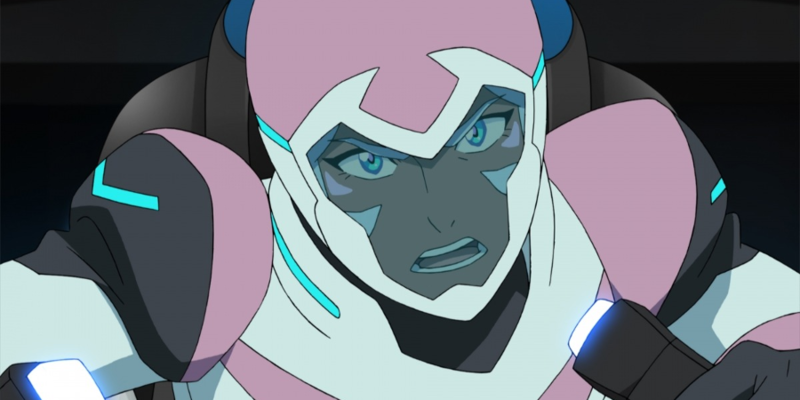 I also just didn’t like that Allura had some attraction to Lotor, because she’s otherwise represented as being pretty insightful, and Lotor came across as really oily in all their interactions. And now, I guess, the big one: I don’t like Hunk. This is really annoying, because I don’t want to dislike Hunk. Hunk’s a family-oriented domestically-skilled fat guy who isn’t afraid to show his vulnerabilities and he’s a person of colour and there’s a bunch of cool stuff going on with his character. But I don’t like him, and I want to make it clear that my dislike of Hunk has nothing to do with How He’s Fat, or how he’s Vulnerable. There’s this way of talking about characters in this series that echoes to me of what I’ve called TvTropes criticism, which tries to make a distaste for a show an issue not of preferences, but of moral facts, and one of the easiest vectors for that is Doing Representation Wrong. Hunk’s a brown guy, a vulnerable guy, and he’s a fat guy, so there’s a lot to grapple with there both in terms of getting it right and getting it wrong. 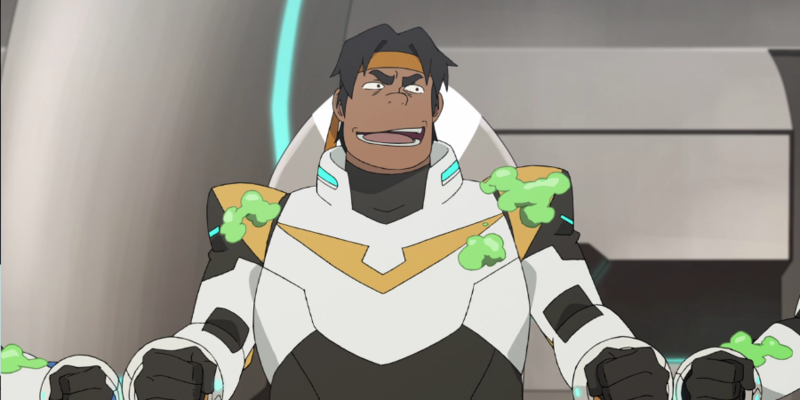 Hell, in the doofus-driven heckpit that is the Voltron wiki, there’s a contention that Hunk isn’t fat and it’s all just ‘dense muscle.’ Does that disqualify him from the conversation? People don’t consider him fat? But some do? I mean, is Hunk a fat character? I thought so. At the same time I’ll definitely understand if someone else tells me they don’t see it. Maybe he’s just big. Maybe he’s that kind of Non-Fat Fat. I really don’t know this whole area of the character and I don’t feel informed on the fat side of academic media discourse. I normally defer to the experts. But despite all that, despite the very legitimate academic criticism of how Hunk represents fatness, I don’t want to present my opinion of Hunk as being a fact, too. This is a very personal thing. Remember how I said two weeks ago that Voltron: Legendary Defender is a series made up of archetypes? This often means there’s a lot of blank space for a character, places you can put anything you like. It also means it’s easy for you to forget things about a character that happen that don’t fit your vision of the archetype. The series tells us, for example, that the Black Lion likes stable born leaders, but it winds up choosing Keith, who goes on to demonstrably not be a stable born leader. So right there, you have two conflicting pieces of in-universe information, and it’s up to you to decide how you want to split them. The problem for me is that Hunk will always be that guy who ignored Pidge. It’s in the first episode. Pidge goes out to listen to space with a bunch of alien gear. Hunk starts examining this thing he says he doesn’t understand. Pidge tells him to stop it. Hunk then probes at it anyway. Pidge tells him to stop again. Hunk keeps at it. Pidge tells him that he’s gotten his second warning, and when Pidge turns away he moves to touch it again. It’s meant to be funny, but that one interaction, gnh. Later in that same episode, Allura talks about how the Yellow Lion is going to the guy who’s a compassionate center, a heart of the group. After showing me that Hunk ignores people’s boundaries, the show went on to dig Hunk into a deeper and deeper hole. Hunk didn’t save Lance from an attack by blocking with his body on purpose – it was a lucky accident. Hunk deliberately probed Pidge’s memories when told to stop. In numerous scenes he’d just roll over and ignore what people were doing or saying, talking about his own thing. He runs down the ideas of his friends, complains about his own feelings, and is never the person people turn to to talk about their emotional problems. Towards the end of the seventh season, the series tries to hammer home that Hunk’s complaining is all a sign of how good he is, because he’s afraid and acts anyway. And this thought, that there are characters explicitly outlining the Hunk that we’re told he is, both at the beginning and end, and yet through the middle I feel that he never showed me that person. Next week, we’ll finally get to the finale of Season 8, and why I like it so much.